← When Does Camping become Glamping? Well you’ve worn a feather boa in Rio, caught beads in New Orleans and dressed with a papier-mâché head in Sydney so what LGBT Festivals worthy of note are left? Well one of the most lively and unlikely of destinations is Cardiff in South Wales. Despite having the reputation of rugby, mining and choir singing it has a vibrant and active gay and lesbian scene. 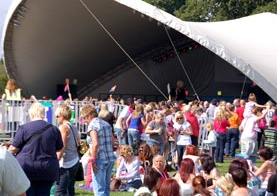 Every year on the first weekend in September, more than 40,000 LGBT revellers descend on the city for a weekend of glittering entertainment with fun and raunchy cabaret. The main party area is the massive expanse of Bute Park behind the gorgeous old Victorian Castle. 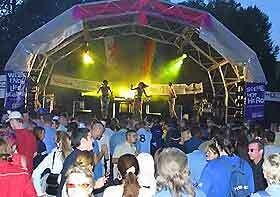 Here there are marquees, stalls and stages a plenty where people perform and dance the night away. There are also a number of gay friendly venues throughout the city that are hosting events ranging from theatrical groups, performance and sedate tea dances. There will be a selection of films on show at the Chapter Arts cinema. You are bound to have a weekend swamped with impersonations of Shirley Bassey and Lliza with two “LL’s”, this being Wales and all. This year you missed the comparing excellence of Fanny Dazzle, Bella Endez and Kitty and Marcia. There were performances from Cardiff based group Fine Line and an exhibition of Urban Freestyle Display on their BMX bikes. As this is Wales you’d have to see the Gay Men’s Chorus and Madis Gras wouldn’t be the same without emo disco, this year provided by Bright Light was a must. So if you are wondering where to be out, about and proud next year, put September in your calendar for a weekend of top quality free entertainment. 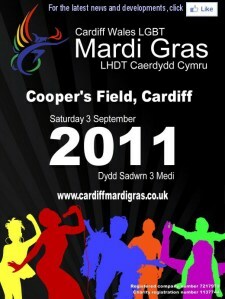 This entry was posted in Festivals and tagged Cardiff, Festival, Gay, Lesbian, LGBT. Bookmark the permalink.